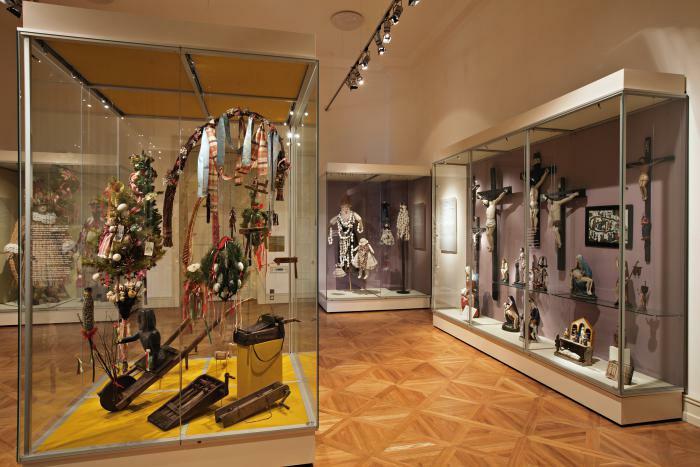 The permanent ethnographic exhibition acquaints viewers with everyday and festive life in Bohemian, Moravian and Silesian villages in the 18th, 19th and the first half of the 20th century and represents traditional folk culture in the Czech Republic. The first part of the exhibition presents everyday life with an emphasis on material culture. This part of the exhibition shows the products and working tools of folk craftsmen and farmers (folk ceramics, folk housing), as well as unique items associated with festive and spiritual culture (folk costumes, folk art). The second part of the exhibition presents folk customs, annual ceremonies and customs of traditional agricultural year - from spring (carnival, Easter) through the summer and autumn (Pentecostal celebrations, summer fairs, harvest festivals) to winter (St. Nicholas and Advent marches, Christmas traditions associated with the celebration of Christmas Eve). The final section of the exhibition presents the human life cycle (birth, death, marriage) and family ceremonies connected with the course of human life.